Aside from releasing a brief video statement where he attributed the decision to revoke Julian Assange's asylum to the Wikileaks' founders' repeated rule violations, as well as Assange's refusal to stop interfering in global affairs, Ecuadorian President Lenin Moreno has remained conspicuously silent in the days since British police entered his country's London mission and arrested Assange on charges of skipping his bail and conspiring to break into a government computer. But that changed on Sunday, when the Guardian published Moreno's first interview with an English language news organization since Assange's arrest. And in a revelation that appeared to undermine his insistence that Ecuador's decision to revoke Assange's asylum and citizenship wasn't influenced by foreign powers, Moreno changed his story once again, telling the Guardian that Assange had tried to use the embassy as "a center for spying." "Any attempt to destabilize is a reprehensible act for Ecuador, because we are a sovereign nation and respectful of the politics of each country," Moreno said. It is unfortunate that, from our territory and with the permission of authorities of the previous government, facilities have been provided within the Ecuadorian embassy in London to interfere in processes of other states." "We cannot allow our house, the house that opened its doors, to become a center for spying." Of course, Assange's arrest came just one day after Wikileaks held a press conference to accuse Ecuador of illegally spying on Assange. 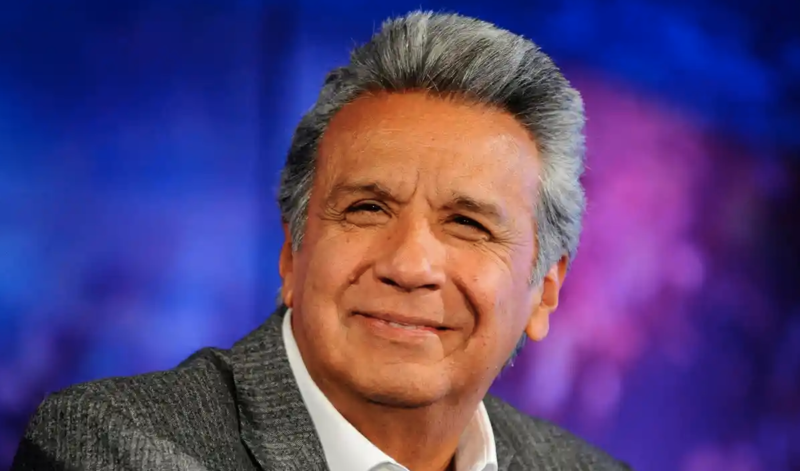 Critics, including Moreno's predecessor Rafael Correa, have accused Moreno of bowing to pressure from the US, hoping Assange's arrest would help Ecuador secure a lucrative trade deal or convince the superpower to cancel some of his country's debt. Correa, who championed Assange and was responsible for initially granting him asylum back in 2012, accused Moreno of committing "a crime that humanity will never forget" in deciding to turn over Assange. Responding to these claims, Moreno called them a "fallacy". "It is a fallacy that there will be debt relief in exchange of Assange. This statement has been generated and disseminated by groups related to the previous regime that did not want to find a solution to the Assange case beyond having him locked up in our embassy. With the United States, we work on issues of cooperation, trade, culture and security. At no time has Assange’s status been negotiated with that country." Moreno denied that his decision was retribution for Wikileaks' publication of intimate family photos, as well as Wikileaks' drawing attention to documents pertaining to the INA scandal, which has stoked suspicions of corruption after Moreno was linked to offshore accounts believed to have been started by his brother. Others have argued that the Assange arrest may have been an effort to distract from the scandal. Moreno also blamed Assange's "unhygienic" habits and belligerence toward embassy staff for making his asylum "untenable." Moreno lambasted Assange’s treatment of his diplomatic staff in London. "Assange’s attitude was absolutely reprehensible and outrageous after all the protection provided by the Ecuadorian state for almost seven years. He mistreated our officials in the Ecuadorian embassy in London, abused the patience of Ecuadorians. He developed an aggressive campaign against Ecuador and started to make legal threats even against who was helping him." "He maintained constant improper hygienic behaviour throughout his stay, which affected his own health and affecting the internal climate of the diplomatic mission. In addition, Assange had health problems that should also be resolved." "We never tried to expel Assange, as some political actors want everyone to believe. Given the constant violations of protocols and threats, political asylum became untenable." He also claimed that the UK had provided Ecuador with written assurances that Assange wouldn't be turned over to any country where he could face torture of the death penalty, something that the UN has warned about should he be handed over to the US. Rebutting Moreno's claims, Assange’s lawyer Jennifer Robinson said these were self-serving arguments that sought to paper over the fact that Ecuador had violated international law. "I think the first thing to say is Ecuador has been making some pretty outrageous allegations over the past few days to justify what was an unlawful and extraordinary act in allowing British police to come inside an embassy," she told Sky. Pressed over the veracity of the allegations, Robinson said: "That’s not true." Of course, as Gateway Pundit journalist Cassandra Fairbanks has reported, Ecuador's claims that Assange's room at the embassy had been transformed into a "fetid lair" have been greatly exaggerated. Meanwhile, Ecuador's former London consul has accused Moreno of breaking the law by ousting Assange.